Tottenham have extended the loan deal of Radek Cerny until the end of 2008. 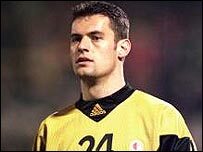 The Czech international keeper, 32, joined the club on an 18-month deal from Slavia Prague in January 2005 as cover for Paul Robinson. Spurs Sporting Director Damien Comolli told the club website: "Radek has impressed everybody in the 15 months he has been at the club. "His application, professionalism and team ethic is outstanding. He is an extremely popular member of the squad." During pre-season, Cerny featured in the club's Peace Cup success in South Korea and has provided the goalkeeping back-up in every Spurs match this season. The two clubs already share a connection - British investment company ENIC has a share in both Slavia and Tottenham and teenage striker Tomas Pekhart last week completed a switch to White Hart Lane from Prague.